I didn’t grow up receiving a regular weekly allowance. I can honestly say as an adult that this has played a huge role in the financial choices I made growing up. Since no one taught me, I had no idea how about money management. Sure, I played with monopoly (play) money in grade school for pretend math class assignments, and gladly handed over my pocket change when the credit union came each week to collect our money putting it into a savings account for us, but I really had no understanding of money. Even as I grew up and got my first part-time paid job in high school, I didn’t know what I was supposed to be doing with my paycheques. All I knew was that I was making my own money now and no longer needed mommy every time I wanted something. 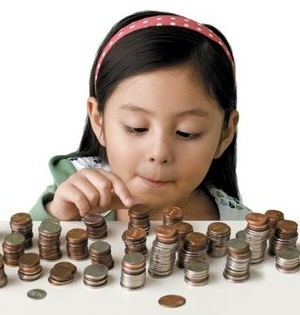 For these reasons I personally believe allotting an allowance for kids is important. I plan on implementing a weekly allowance for our daughter when she’s old enough to understand what money is, probably around the age of six to seven. I want her to understand why she cannot have something other than me just saying ‘no’. I want her involved in purchases that affect her and help make the decision. I need her to understand the importance of savings. All of these things cannot be fully understood with ‘play’ money. Have you ever tried to play a poker game with fake money? The betting can get ridiculous because you have no real ‘skin in the game’ so-to-speak. Honestly, right now (her being seven months old) I don’t have an exact amount in mind that we’ll give her but it will be a percentage of money we plan on spending on her anyways. What I mean, is that we don’t necessarily plan on creating a whole new section of our budget for kids allowance, rather allocate money to her from money we would have spent anyway (clothing or shoes for her, school supplies etc). This way she can be involved in how her money is spent. As parents we are responsible for spending money on her for the next 18 or so years, why shouldn’t she have some involvement? One option is giving a weekly amount (say, $3.00 a week to start) and teaching how to save a percentage and budget for things desired. When she gets older maybe we will make her responsible for handling and helping budget for larger purchases like back-to-school shopping. Whatever option ends up working for us, the key is to have her directly involved in buying items so she can learn to respect money and understand that it is not an infinite resource. I also don’t want to pay her only when she does household chores which is a common criteria for parents to award allowance. As a member of our family, when she gets old enough, she will have an unpaid responsibility to contribute to our household. Should she go over and above her required chores and do extra, she may be able to make some extra money, but I refuse to pay her for normal expectations. When we go shopping I want her to understand the importance of shopping with a list and sticking to it. This will teach her the importance of budgeting and planning. She will learn that if something is not on the list we won’t be buying it today, and if we (she) sees something while we’re out that she may want, we have to make a plan on how to buy it. These are all tools I wish I had in my back pocket. Not that I grew up thinking money was an infinite resource, but I never appreciated the value of a dollar until I was much older and in a boat-load of debt. Everything I know about money is 100% self-taught. I still have a way to go but my hope is that through allocating a proper allowance and starting early enough my daughter can avoid the same paths I’ve already been down. If you have kids, do you give them an allowance? How much?